I’m back in England after a relaxing holiday in Spain! Continuing on with the Spanish-themed recipes and also having lots of avocados in the fridge I decided to make this authentic guacamole! It is so simple to make and is delicious served as a dip or spread on oatcakes! It is also rich in Vitamin C and is great for detoxing with the coriander. Finely chop the onion and place into a bowl. Now chop the tomato into quarters, then using a knife cut off the skin of each quarter in one movement. Chop up the tomato pulp and add to the bowl. Chop off and discard the stems of the cilantro, then finely chop the cilantro leaves and place in the bowl. Cut the lime in half and squeeze the juice of each half into the bowl. Now cut each avocado into quarters and pull out the stone. Peel off the skin of each quarter and put the avocado flesh into the bowl. Now using a fork mash up the avocado and mix together all the ingredients well. 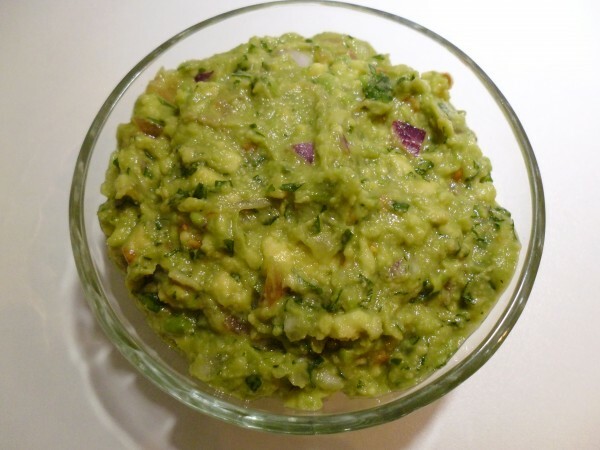 Spoon the guacamole into a small bowl and serve with tortilla chips or vegetable crudites as a dip. Also delicious spread on oatcakes or rice cakes. Store in an airtight container in the fridge. Eat within 2 days. Looks delicious and I love avocado.